Kraków szopka [ˈkrakuf ˈʂɔp.ka] or nativity scene (crib, crèche) (Polish: Szopka krakowska) is a Christmas tradition originating from Kraków, Poland, and dating back to the 19th century. An unusual and characteristic feature of the szopka is the use of historical buildings of Kraków as backdrop for the Nativity of Jesus. In 2018, it was inscribed on the list of UNESCO Intangible Cultural Heritage of Humanity. Nativity scenes, common in Christian cultures, originated with Saint Francis of Assisi in the 13th century and quickly spread to Poland. 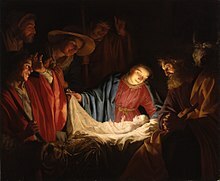 During the Middle Ages a specific type of nativity-based play, referred to as Jasełka, developed in Poland. Some performers displayed their szopkas together with puppets in a form of a street theatre. In some, movable puppets were replaced with immobile wooden figurines. At times subject-specific puppets or figurines were and are being added to illustrate elements of Polish culture, ranging from historical figures like winged hussars and Tadeusz Kościuszko, through the legendary sorcerer Pan Twardowski and Dragon of Wawel, to contemporary politicians or artists. 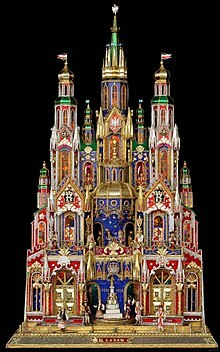 In the 18th century the spread of such non-religious content led to a ban on more extravagant nativity scenes in some Polish churches; following the ban, the performances evolved into a true expression of folk art. The szopka tradition dates back to the 19th century, when Kraków's craftsmen – masons, woodworkers – begun to make them as a seasonal decoration in order to earn extra income during Christmas. The custom grew in popularity, with people willing to pay to watch szopka collections – often carried by door-to-door carollers – or to own them. Among the notable early patrons of the custom was the magnate family of Potoccy. After Poland regained independence in 1918, szopkas started to be made and sold as souvenirs of Kraków. The city's municipal authorities decided to support this tradition by announcing the first competition in December 1937. Since then, except for the duration of the Second World War, the szopka presentation and tournament takes place every year on the first Thursday of each December, at the Main Market Square, Kraków, next to the Adam Mickiewicz Monument. The best szopkas are then displayed in the Historical Museum of Kraków in Krzysztofory Palace. The ornate structures can be up to two metres high and three metres wide. The edifice most often used as an inspiration for szopka models is the St. Mary's Basilica, Kraków with its easily recognisable spires. Other popular choices include Wawel Castle, Sukiennice trade hall and the Barbican of Kraków. The Bethlehem is often shown on the second floor, as the first one is used for a display of historical figurines. ^ "Nativity scene (szopka) tradition in Krakow". Retrieved 2018-11-30. Wikimedia Commons has media related to Krakow cribs. This page was last edited on 30 November 2018, at 09:20 (UTC).